As part of the 21st Century Renaissance programme, the Ismaili Centre, Burnaby, is pleased to host Judith Marcuse from the International Centre for Arts and Social Change at Simon Fraser University and Sandra Singh, Chief Librarian at the Vancouver Public Library. Judith Marcuse’s career spans over 40 years of professional work as a dancer, choreographer, director, producer, teacher, writer, consultant and lecturer in Canada and abroad. 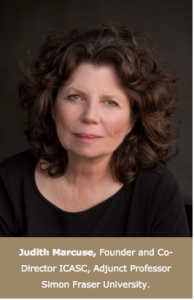 Among many honours, she has received the Lee and Chalmers Canadian choreographic awards and an honorary doctorate from Simon Fraser University. She presently leads a five-year research study on art for social change in Canada and, in September 2016, launched a new, two-year Masters (MEd) program in arts for social change at Simon Fraser University. The lecture will address the role of the arts in social development both locally and globally. Admission is free. Please register here. Sandra joined Vancouver Public Library as its Chief Librarian in December 2010. She joined VPL after serving as the Director of the Irving K. Barber Learning Centre at the University of British Columbia. She is also currently the President of the Canadian Library Association. 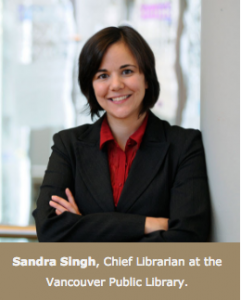 As the head of Vancouver’s largest public library, and the youngest head of a major public library in Canada, Sandra Singh is at the helm of exciting changes in how libraries are used and understood by the public.